Is “microtransit” just dial-a-ride by another name? How does the number of new housing units (net) compare to the growth? It seems at least that the rate at which new units are coming to market is increasing over this time period. with 356,568 available housing units (2.05 people per unit). Since 2010, housing hasn’t kept pace with population growth, density per unit has increased. 2.05 vs 1.97 is pretty much dead even. I’d expect within the margin of error and that’s from just after the crash until today. It took several years for construction of new units to really ramp up to what is being churned out today. I’d wager that we’re ahead of 2010 numbers in terms of available housing by the end of next year. That said, I’m also pretty sure the average cost is going up perhaps faster than income. And with the real estate market as bonkers as it is I think prices are forcing more people to rent vs buy than in previous boom cycles. The number of actual people per unit doesn’t tell you the number of people wanted per unit, or whether 2.05 is good or bad. But anecdotally we know that a lot of people are living with their parents or with roommates because they can’t afford to do otherwise, and that families can’t find the 3- or 4BR units they want. After WWII there was a similar housing shortage when all the GIs came home and nothing had been built since the 20s. There was certainly a lot of housing built in Seattle. Entire neighborhoods were erected to house Boeing workers. Same thing elsewhere to support ship building, etc. This was the start of the great migration from rural to urban life..There was a huge increase in household income in the decades following WWII which spawned the demand and growth. We’re seeing the effects now of a strong economy and in King County a huge influx of high paying jobs. According to Mike Rosenberg of the Seattle Times, “Nearly 10,000 new apartments are set to open in Seattle during 2017 — almost twice as many as in any previous year… The city is on pace to see more apartments built this decade than in the previous 50 years combined — and the vast majority of the new units haven’t opened yet” It appears the building has caught up with growth. But as you point out, that doesn’t mean there aren’t people wanting of housing that doesn’t exist. Those high paying tech jobs have moved the demand curve to the high end. There’s lots of affordable housing, it’s just there are lots more people that can’t afford it. Housing issues are more complex than just counting a total. The size or capacity, affordability, livability and location are all issues. People are also choosing to live outside of the City limits. I’ve always liked a comparison of jobs to working age residents better. Comparing number of units to residents seems kind of like asking how much more coffee can fit inside a mostly full bag. “Is micro transit just dial-a-ride by another name?” in a sense, yes. But, it’s much easier to use than dial-a-ride ever was. You can book a ride 5 minutes before getting picked up, rather than hours or days. There’s enough vehicles around to make spontaneous bookings possible without hours of wait time. You don’t have to struggle to hear a human on other end above the roar of traffic. And, you can be picked-up 24 hours a day, 7 days a week, whereas most traditional dial-a-ride services only operate during the daytime hours on weekdays. 1) The cost of the subsidies increases with each individual user, like a bus, where filling in empty seats costs the agency nothing, until the bus is full and they have to run another bus. 2) Since microtransit is more convenient for users, more people will want to ride it than a bus (assuming identical fares, after subsidy), hence the system will burn through money much faster. For all the problems of the hourly bus, the total operating cost per day and per-year is at least known and fixed, and can be budgeted for, regardless of the number of people that ride it. This translates to predictable service that people can depend on for the long-term, rather than a pilot project which will abruptly shut off, the moment too many people start using it, and the funding runs out. Note to editor. Trying to link around paywalls with shortcodes sometimes works, sometimes doesn’t. Many sites link directly and use a ($) to indicate paid content. I’m in Berkeley this week and heavily using BART. One weird thing I noticed is that AC transit runs a bus (route F) that goes straight to San Francisco from Berkeley every half hour, 7 days per week. This is entirely duplicative with BART, which has better frequency and speed, and a timed transfer when the red line isn’t running. It would be like running the 71/72/73 all day to downtown after U-Link. It goes through Emeryville on the way. The buildings there — residential, office, retail — are big enough to make Ballard look more like a small town. Those bus routes are direct descendants of the Key System, which was a privately-owned rail network that connected the East Bay to San Francisco long before BART did. Trains ran on the lower deck of the Bay Bridge into the former Transbay Terminal. They were replaced by buses in 1958 and then sold to AC Transit 2 years later. AC Transit transbay bus is at least $1 cheaper than a combo BART + AC Transit local trip with Clipper discounts. Under Bay Area fare rules, a trip from Wedgwood to Columbia City that involves Metro bus and ST Link would cost $5.00 each way, not $2.75 for two hours. Also, BART doesn’t offer monthly passes for transbay commuters, AC Transit does. If your employer doesn’t pay for your transit, the costs quickly add up. That’s really unfortunate then. Clipper really should have universal transfers like Orca does. In fact, not having free transfers from BART to local agencies seems like a huge waste of the very large infrastructure of BART that could be made much more usable. That being said, with all the service hours AC transit uses to get across the bay (not just F, but there are many all-day routes to other places and a lot of peak-only routes too), if they strip that down to only night owl service (when BART doesn’t run), then they could almost certainly create frequent BART connectors on the Alameda County portions of the current letter routes at 15 minutes or better, with money leftover. They could use this money to pay for free transfers from BART, and even (if local laws allow) buy the BART frequency boost to 15 minutes on weekends (which BART had for a bit but stopped because they lacked funds). In fact, West Oakland is an extremely good transfer opportunity from a frequent bus (or better yet, BRT) since at best there are FOUR lines to San Francisco (and at worst 2). Definitely worth a look to do off-peak. The peak service probably would be retained as BART doesn’t have much excess transbay capacity during peak hours. They’re studying a second bay crossing. For all its flaws, I get the sense that Puget Sound’s universal transfers and passes are underappreciated in context of what other regions like the Bay Area or Southern California have to deal with. For sure. I’m back in Seattle and feel spoiled, I could take 4 buses to get where I’m going and only pay one fare. Of course, if it takes 4 buses to get where I’m going, I wouldn’t want to pay very much anyway. But especially after coming a vacation from both the bay area (with no free transfers from BART to AC Transit to SamTrans, CalTrain and VTA, etc) and the LA area, where I was using Santa Clarita transit, which doesn’t even have transfers within the same agency, even with the smart card (it’s $1 for each bus you board). But at least you “get” $.50 off for “transferring” from a SCT express to a LA Metro rail line. There are, or at least were, transfers from BART to AC Transit but not on Clipper. There’s a machine at the exit where you get a 2-part transfer good for a round trip from BART. Mike, the BART to AC Transit transfer ticket gives you a discount. It’s not a free transfer. Each part discounts 25¢, whereas Clipper automatically gives you 50¢ off when taking a bus from BART. Interagency transfers in LA County cost 50¢ but you have to buy it when you board the first bus so it’s not very flexible or convenient. Thankfully that’ll change next Sunday when they make it automatic with a TAP card. Political power follows population growth. All counties in the state, except Garfield, have added population, but the biggest gains are in King, Snohomish, Clark (Vancouver) and Benton/Franklin (Tri-Cities). King and Snohomish counties together have increased their populations enough to gain another half of a legislative district which will probably be in Seattle. The biggest counties that will be losing some of their political power include Yakima, Spokane and Kitsap–they have increased their populations but not enough to keep pace with the increases in other counties. Somebody who knows, tell me, and I won’t rat you out: Is there somebody actually willing to fight for a $2.75 fare instead of $2.00? Or, with allowance for age and income, $3.00? Since Metro discovered chips of magnetic metal-bearing rocks, this hasn’t been my problem. But we’re talking about that horrible yellow ring-worshipper that keeps getting Hobbits get killed. Gimme my big hat and point me down the right tunnel at Capitol Hill Station. Gandalf already loaned me that tree branch he carries around all the time. How much would it cost our system to do fare-free weekends for a shake-up? Or even a month, just to see what happens? Or if that’s too risky, every Friday pm rush hour when there’s a Game in town? It’ll be worth the whole thing just to make the system cough up the cost of one minute lost operating time. Anybody that knows, what’s the vet charge per hour to get a hairball out of your cat? Metro offered free service on New Year’s Eve, along with extra trips. 1) Thanks for using my photo. The vote of confidence means a lot. 3) I was recently on People Mover in Anchorage for the every-even-numbered-year Arctic Thunder airshow up there. 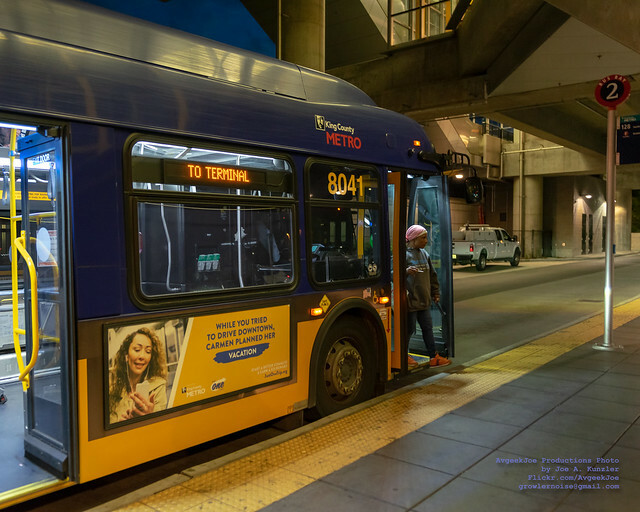 Really like their idea of “Be A Kind Human” up on the ceiling of the buses – maybe some of the transits in our region like Sound Transit ought to do the same! “A million daily riders…” will use the Downtown light rail tunnels? They can’t hold that many. I don’t think ST has ever published any forecasted system ridership totals once ST3 is completed. Instead, there are ridership forecasts for individual segment — so adding them all up creates lots of double-counting. A certain percentage of those (maybe 80%?) will be getting off at stations in the tunnels to be replaced by passengers getting on (maybe 50%?). I get around 96,000 per hour. Peak period is probably something like 4 hours per day, so that’s 384,000 per peak period. Off peak is maybe 15 hours a day at half of peak, so around 1,440,000 or so. I wind up with about 1,824,000 per day. So, I don’t see where the tunnels are lacking in enough capacity to handle 1 million per day. The report says 2800 boardings per day at CP Station spread out over 817 buses. That is only about 3.5 boardings per bus. That is pretty low for what is supposed to be a major downtown transit stop. I know CP Station has always underperformed,but is it really that bad. And I still wonder if it is really worth it to build the temporary ramp to keep buses in the tunnel for just another 8 months. Seems like a lot of effort for literally no net gain. I’d just move the buses to the surface now and let people adapt to the new configuration in advance of all the other 2019 challenges. 3.5 board per bus assumes even ridership throughout the day. Presumably, boardings per bus is much higher during commute times. The gain isn’t in ridership, it’s in cost. Running the buses on the surface is more expensive because of higher congestion, so the idea is to keep buses in the tunnel as long as possible. Yes, I am sure that running buses on the surface will increase cost marginally because of somewhat longer transit times. But that ignores the fact that Link will get quicker and more efficient and thereby reduce cost. Additionally, the Pine Street Group was specifically required to fund certain mitigations to exactly the problem you cite as a precondition to being allowed to proceed with the Convention Center expansion. It seems wasteful to require them to fund short term fixes like the temporary ramp and also long term mitigation’s too. This is particularly true since we haven’t entered their period of maximum constraint yet and (at least theoreticallly) we still have time to get it right. Remember when the match was originally 50%? How quaint, eh? This really shows you how badly Sound Transit estimated the cost for this ST2 project. Fine, then. Let’s quite wasting taxpayer money and just truncate the system at Northgate and call it good. ST can build a ramp and cool bus intercept terminal above the new station! I know this is unneeded snark, but seriously, WHY do you keep harping on the cost over-runs without suggesting some punishment for management and the Board or at the very least suggest some way(s) to reduce them. You have said that you are excited to have the opportunity to ride a reliable train in five years. Keep harping on this and someone in authority WILL pull the plug, and it’ll be Double Talls Forever! In the company I work for, an estimation miss of this magnitude (as well as what I suspect were attempts to minimize the actual quickly accumulating financial disaster to the board and the public prior to the ST3 vote) would have resulted in terminations of project managers and perhaps whole teams. Of course I work in the private sector where things operate quite differently. Make that six years and your statement would be correct. After observing many ST project budgets and reading up on FTA guidance, a core problem is in the 10% contingencies set up during the planning stage. FTA recommends 30% at the planning level. This budget problem will plague ST until 2040 (because this is what is in ST3) until this inane practice changes. It will mean that every project in every subarea will have to be scaled back. That means no tunnels, few escalators, terrible station access, no adequate transfer facilities and dropped stations. The only things that are likely “safe” are art projects and numbers of park-and-ride spaces.